Richmond’s mild coastal climate means comfortable weather year-round. Unlike other Canadian destinations, there is almost no snow here. And when it comes to rain, our distance from the mountains means Richmond receives about 30% less precipitation than our Vancouver neighbour. Richmond’s average high temperatures hit 23°C/73°F in summer, falling to around 5°C/41°F in winter. Our average temperature for the year is 10°C/50°F. Spring in Richmond is generally mild, combining sunny days with possible showers. Dress in layers (mornings and evenings can be chilly) and bring an umbrella just in case. Don’t miss: parks are starting to come to life while the cherry and plum blossoms on many streets lure nature-loving photographers. Summer in Richmond typically means sunny blue skies plus long days of warm and comfortable temperatures. Bring sunscreen, shorts and T-shirts as well as a light jacket or sweater for evening strolls. 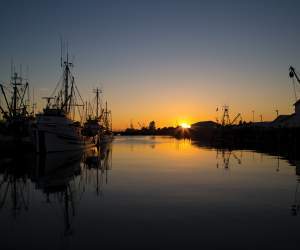 Don’t miss: parks and gardens are in full bloom while this is also an ideal time for shoreline walks, waterfront sunsets and patio dining on Steveston’s charming boardwalk. Fall in Richmond can see summer-like blue-sky days as well as an increase in rain and cooler temperatures. Bring sweaters, a jacket and an umbrella so you’re fully prepared. Don’t miss: in-the-know photographers head back outside, this time shooting the dramatic reds and golds of our lovely autumnal trees. Winter in Richmond is one of the mildest in Canada, with hardly any snow to slow you down. Pack warmer clothing, including light gloves and a winter, preferably rain-resistant jacket. Don’t miss: this is the time to access the region’s ski hills, several of which are less than an hour from Richmond by car. Local parks are also visited by migrating birds—including flocks of scenic snow geese—bringing avid birdwatchers with them. Discover important travel information about Richmond, British Columbia, Canada. Discover everything from historic sites and night markets to outdoor adventure and great shopping!